Hope you all remember little angry Angel I posted photo of few weeks ago. Dear Debi B. asked to try the pattern out. And am glad she has helped me with it. Thank you Debi! 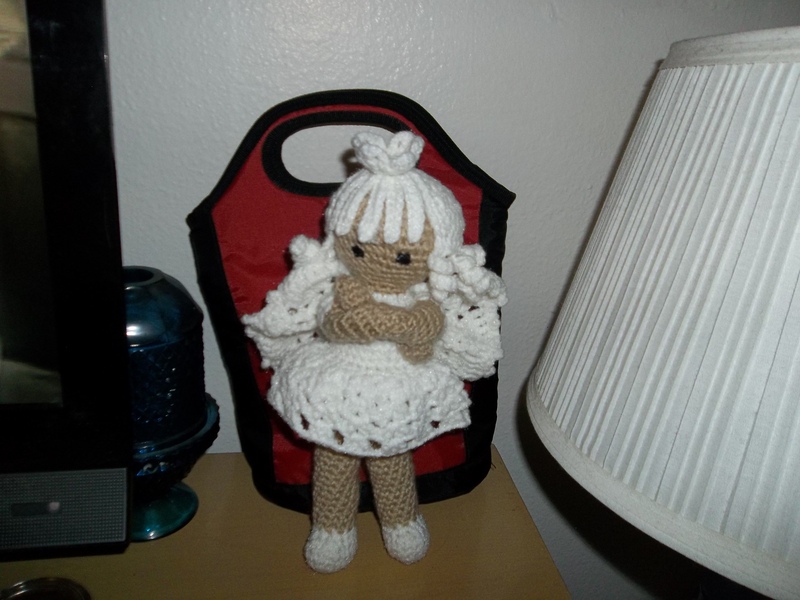 I came out with an Angel pattern after Bonnie B. asked me to create and Angel she could make and donate to cancer ill patients in local hospital, to cheer them up and brighten their day. That is how silly little attitude Angel came to life. Here is a photo of two of them. Wing pattern is not mine. Found it long time ago and used it here. If one knows the original designer and owner of the wing pattern, let me know so can give her deserved credit. Think I better get on with pattern, as I have one (two) more patterns to share today. 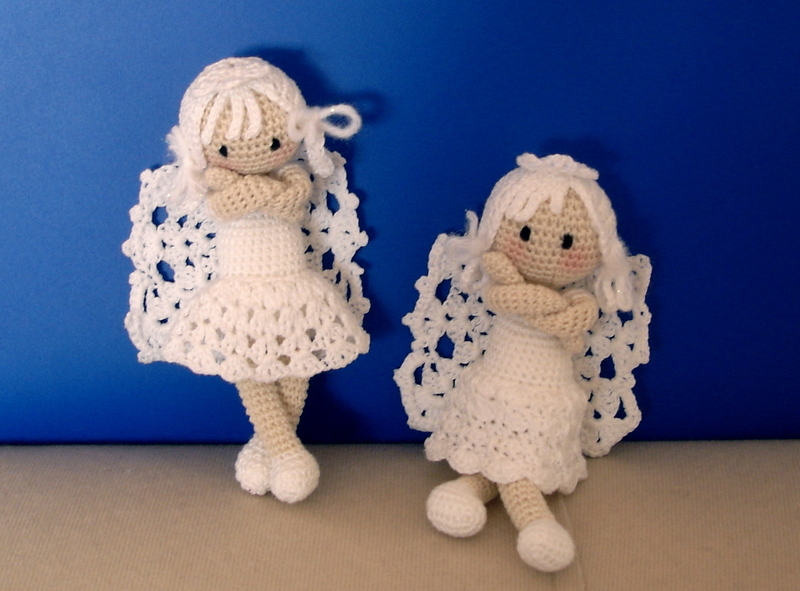 Angel is made in No.10 thread and 1,50 mm crochet hook. FInished size measures 13 cm (5″). 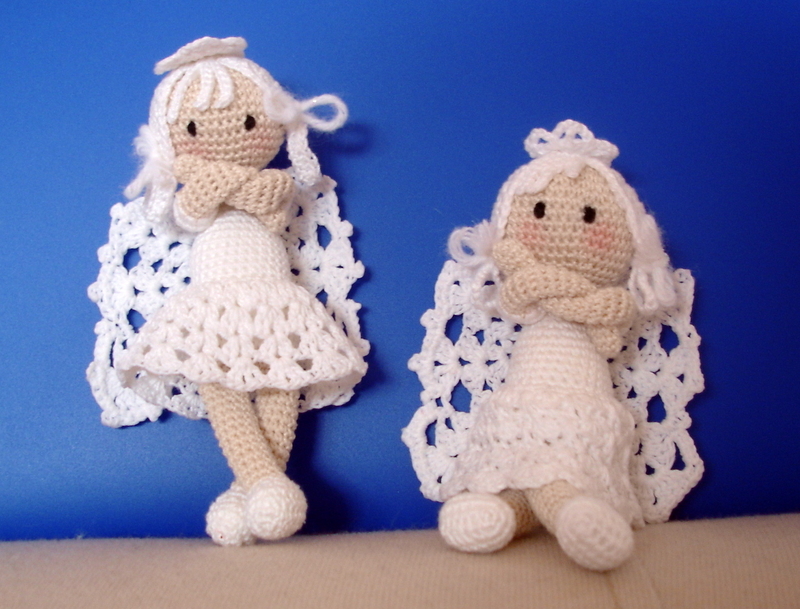 Debi has made her angel in worsted wight yarn and F hook and her angel measures 11″. Here is the photo of her Angel. From materials you will need to make angle is thread or yarn in flash color of your choice, white yarn or thread, little bit of black embroidery thread for the eyes, stuffing, and fabric starch to block and model wings. R – round when worked in continuous rounds or row if work requires turns and straight line following. Stuff legs very, very light. there are two different skirt patterns. I couldn’t decide which one so giving you both of them. If you look at the photo, you can see there are two different skirts. Make one you like better. When it comes to describing patterns with dc and different stitches used I am no expert at all, so forgive me if there are mistakes or misunderstandings. If you will have difficulties, please let me know so can help you so me more with it. R2 ch3, *dc to chain between two dc (dc-ch-dc at previous round), ch3, slip stitch in between petals, ch3* x4 ch3 and slip stitch to the base of first chain made in this round. Sew the star on top of angel’s head. When finished with bangs, continue with single crochet stitches around next side of the hair. Reaching end, tie off. braids and folding them beneath the hair. Added wool bows on top of them. Same way you can make curls. Slip stitch to side stitch, chain desired length for curl to be and either double or triple stitch to one chain stitch in order to reach curly look. Repeat that for two or three stitches one each side. For pony tails, make little tassels and sew on sides. Here is photo of both wings made (not blocked yet). Just to give you idea on how they should look like. 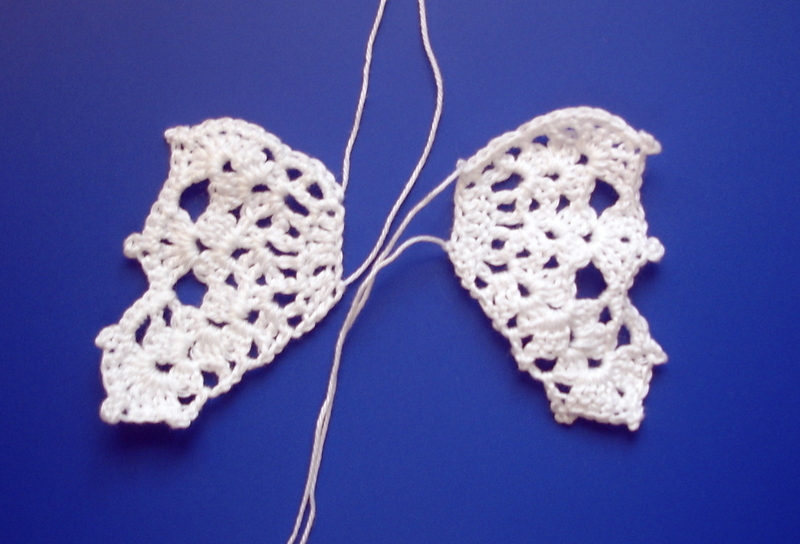 To finish – the pattern uses picots and single crochet around the wing. If picot is difficult, you can single crochet around wing, just to make it firmer, or you can leave it as it is. After both wings are finished, sew them together over beginning 5 chain stitches. Use some fabric starch to harden and model the wings nicely. And that is it! Angel done in no time! Hope you have enjoyed and will even more when your Angel will be finished. It is really fun little one to have near. Makes me smile whenever I see it! A few years ago, one of our local residents, Mac Vorce, who is also a bicycle enthusiast petitioned for the development of bicycle paths and trails. a false stage, will depend on you. Very lovely!!! <3 So sweet!! A nice place to check out patterns. She is so sweet and for a special gilf. She will bring lots of smiles.